WHAT A WONDERFUL PRINCESS TIARA!. 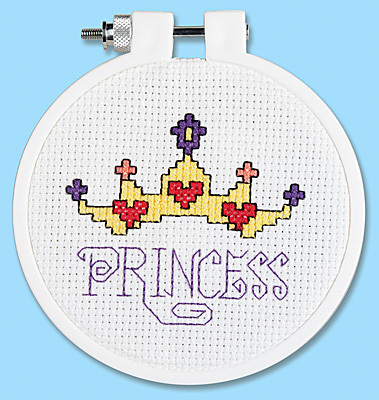 This Counted Cross Stitch Princess tiara will show your daughter how you truly feel about her. Have fun with Janlynn's Kid Stitch™ line. - Frame included. Each kit contains 14 count 100% cotton Aida fabric, 6-strand cotton floss, stitching hoop, needle, graph, instructions in English & French. Finished size 3" round (7,6 cm rond).